Canon U.S.A., Inc. has introduced the compact EOS M100, the successor to the M10 interchangeable lens camera, as "an excellent choice for those looking to step up from smartphone photography." The M100 offers interchangeable lenses, optical zoom and the latest imaging technology, without sacrificing size, style or the ability to share instantly. "We are living in a moment where more images are being taken and shared than any other time in history," said Yuichi Ishizuka, president and COO, Canon U.S.A. "In an increasingly visual world, high-quality images are the ones that truly stand out from the crowd, "The new Canon EOS M100 can be the ideal camera for those eager to step up their images and share their creative vision without sacrificing image quality or on-the-go performance." The M100 has a 24.2-megapixel APS-C CMOS sensor matched to the Canon DIGIC 7 image processor. The 3.0-inch LCD touch-panel display also tilts to aid composition. Video Mode: Full HD 1080/60p video or time-lapse movies. Hybrid Auto pulls still frames from HD video recording. The M100 is scheduled to be available in black or white in October for $599.99 with the EF-M 15-45mm f3.5-6.3 IS STM lens and $949.99 with EF-M 15-45mm f3.5-6.3 IS STM lens and EF-M 55-200mm f4.5-6.3 IS STM lens. In addition, the Canon EOS EF-M Mount Adapter is currently available for a suggested retail price of $199.99. MELVILLE, N.Y. -- Canon U.S.A., Inc. has announced the successor to the EOS M10 interchangeable lens camera: the compact and stylish EOS M100. An easy-to-use yet powerful camera, the EOS M100 is an excellent choice for those looking to step up from smartphone photography, offering the versatility of interchangeable lenses, optical zoom and the latest imaging technology, without sacrificing size, style or the ability to share instantly. "We are living in a moment where more images are being taken and shared than any other time in history. In an increasingly visual world, high-quality images are the ones that truly stand out from the crowd," said Yuichi Ishizuka, president and COO, Canon U.S.A. "The new Canon EOS M100 can be the ideal camera for those eager to step up their images and share their creative vision without sacrificing image quality or on-the-go performance." Canon's newest EOS M-Series offering helps expand creativity while providing the ability to capture photos that simply cannot be matched by smartphone photography. The EOS M100 camera is boosted by a powerful 24.2-megapixel APS-C CMOS sensor and the Canon DIGIC 7 processor. These attributes, alongside Canon lenses, are capable of rendering incredible details even when zoomed in on distant subjects or shooting in low-light scenarios, such as a dark restaurant. Packed with high-end features like Dual Pixel CMOS AF, which enables high-speed focusing for capturing fleeting moments nearly across the entire frame and video mode, novice and enthusiast photographers alike will appreciate the tremendous capabilities of the new EOS M100 camera. For those eager to share family photos, epic adventures or culinary creations with their friends and family, the EOS M100 camera is also WiFi, Near Field Communication and Bluetooth connected, allowing for live-view remote shooting and the viewing and transferring of images to a compatible smart device, via the Canon Camera Connect app. High-quality images and video can be uploaded to a compatible device for easy sharing to select social media networks. Once connected through Bluetooth, the EOS M100 camera can also work with a compatible smartphone's GPS function to provide a geo-tagged log of where every photo was taken on one's journey. Users will also discover a newly designed and intuitive touch interface that makes it easy to choose settings and focus shots, while beginners can learn and improve on their photography using Canon's Creative Assist function, an intuitive setting that allows users to execute their creative vision, even without an "expert level" of camera knowledge. To make a scene brighter or blur backgrounds, users simply select their desired change within the Creative Assist menu and the camera will automatically make corresponding setting adjustments, available immediately in live view. Preferred settings can be saved for next time, while those using the mode will begin to learn more advanced camera techniques to further pursue their creative vision -- beyond just Auto Mode. Sized to be an on-the-go camera, the EOS M100 is slimmer and lighter than other M-Series offerings and fits neatly into a bag with ease. The new sleek and refined design features two body color options -- white or black. The use of interchangeable lenses is a differentiating factor of the Canon EOS M-Series from most smartphone photography, with Canon offering seven distinct and lightweight EF-M lenses, spanning wide-angle, telephoto and macro applications. EOS M100 users can find a lens for nearly any application while maintaining a compact system ready for on-the-go moments. For those with Canon's EF lenses, the EF-EOS M Mount Adapter (sold separately) will allow for the use of Canon's complete lineup of EF and EF-S lenses. Exploring close-up macro photography is also possible using the EOS M100, combined with a macro lens option -- great for wildlife or detailed food photos. 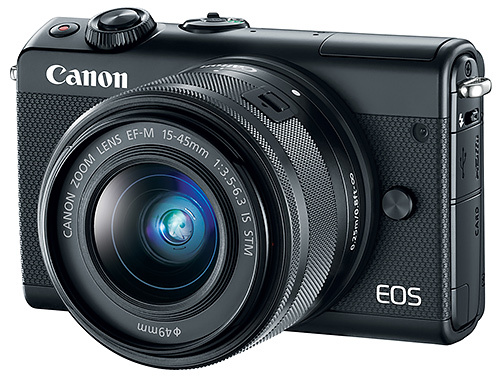 The Canon EOS M100 is scheduled to be available in black or white in October for an estimated retail price of $599.99^ with the EF-M 15-45mm f3.5-6.3 IS STM lens and $949.99^ with EF-M 15-45mm f3.5-6.3 IS STM lens and EF-M 55-200mm f4.5-6.3 IS STM lens. In addition, the Canon EOS EF-M Mount Adapter is currently available for a suggested retail price of $199.99^. For more information please visit usa.canon.com.